Nothing instills confidence in diners more than the name of a well – known chef above the door. From British talent to chefs from afar, there are many celebrity chef restaurants in London that you absolutely have to give a try. Here are five of them to start you off on your journey of culinary adventures. Jamie’s Italian is designed in such a way that it makes you feel at home, but with a difference. There are Vespa headlights covering one of the walls and one area is surrounded by potted herbs. The restaurant is open seven days a week from 12h00 to 23h00 with the exception of Sundays, when it closes at 22h00. A main course will cost you in the region of twelve pounds and a three course meal about thirty pounds. Most of the ingredients used in this restaurant are fresh of freshly made, like the pasta (home – made) served with succulent prawns or the turkey Milanese with shaved truffle. Try out the freshly baked Amaretto Brownies or the peach and almond frangipane for dessert. Jamie has chosen some very good wines and also offers very interesting cocktails. This French inspired restaurant is situated in Conduit Street, Mayfair and has earned a few awards for service and the quality of the food. This trendy venue is open Monday to Saturday from 18h30 to 02h00, and lives D.js pitch up at 22h30 every evening. A main meal will cost in the region of twelve pounds and a three course meal about thirty pounds. Artworks from the artist known as Martin Creed are scattered throughout the restaurant, on the walls, floors and furniture. Master Chef Pierre Gagnaire has combined his knowledge with the very best ingredients to produce a fabulously French menu. Here you can enjoy a variety of well known wines and be served by well trained staff. This restaurant is situated in Brook Street. It is open for lunch from Monday to Saturday and dinner every evening of the week. A main meal will cost you in the region of twenty five pounds and a three course meal about seventy pounds. This European fine dining venue is definitely the place to go to if you are looking for impeccable service and fantastic food. Lobster and braised radishes are just one of the amazing dishes available on Gordon Ramsay’s menu. This is a great venue to host a party in and is also the perfect place to wine and dine the lady of your choice. The restaurant is within walking distance from Piccadilly and the popular shopping districts of Oxford Street. Benares is situated in Berkley Square. This modern Indian restaurant is open every day of the week from 12h00 till late. The cost of an average meal is around twenty four pounds and a three course meal will cost in the region of fifty pounds. Atul Kochhar is the mastermind behind the spicy dishes on this menu. All the lamb and chicken dishes are strictly Halal. One such example is the Marsh lamb cannon with white aubergine purée and artichoke Fritters, which has been rubbed with a number of delicious spices before cooking. You cannot leave here without trying the rose bhapa doi, hibiscus sorbet and fresh raspberries, which is more than likely the most fantastic dessert you will ever try. 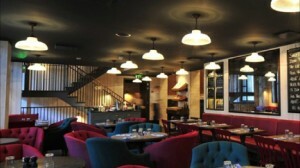 Galvin at Windows is situated in the famous Hilton Hotel. The restaurant is open for lunch from Monday to Friday and dinner from Monday to Saturday. The views are truly breathtaking from this French restaurant, which is located on the twenty eighth floor. Galvin at Windows offers guests a wide variety of delicious menu items, and have everything from oyster velouté to Champagne vinaigrette. They also offer a number of great vegetarian options such as wild mushroom risotto. You absolutely must try the Manjari chocolate ganache with hazelnut and salted caramel for dessert. These are only five of the celebrity chef restaurants in London. There are many more, but these five are at the top of our list and will soon be at the top of your as well.